Home » Blog for Learning and Development Training Tips » What is Category Management? The retailing concept of Category Management originated in the late 1980s. It followed the research of Brian F. Harris, a former professor at the University of Southern California. It changed in the way retailers and suppliers worked and transformed the way in which products were promoted in-store. Instead of competing with each other, for the first time Category Management encouraged suppliers to work together. Furthermore, the focus shifted to the consumer when making retail decisions. Category Management should no longer occur in isolation once every six months. Working together is part of day-to-day product management. There should be a relationship of trust and the sharing of data and ideas. Long gone are the days of oppositional relationships between suppliers and retailers. 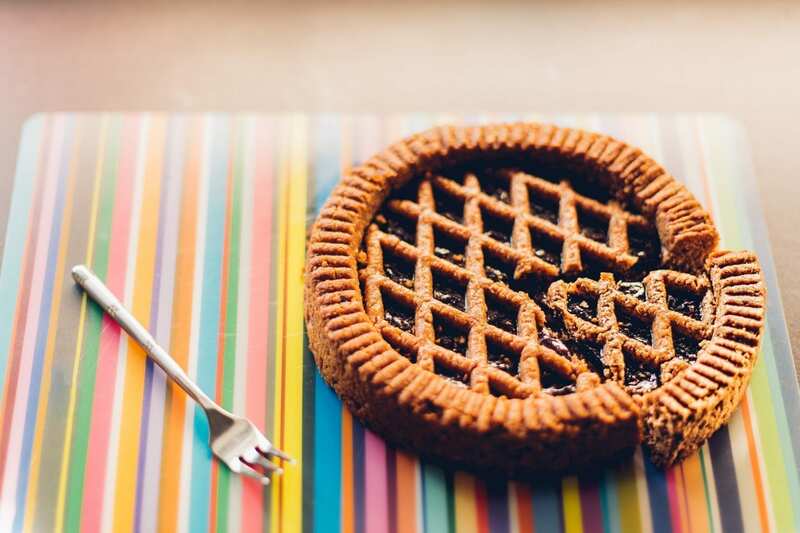 [If the ‘Choux’ Pastry Fits] What is Category Management? Historically, retail categories would contain lots of brands from different suppliers. The situation would arise that every time brand X promoted its products, the sales of brand Y would go down. One benefited at the expense of the other. In short, they were competing with each other. There was, therefore, no net gain for the retailer. For the first time, the retailer grouped the range of products offered for sale together. The groups were based upon product similarities and the consumer need they met. The management of these ‘product categories’ treats them as a Strategic Business Unit (SBU), and no longer as stand-alone products or brands. The retailer now monitors the profitability of the whole category and not just individual products. ‘Canned Soup’, for example, is one unit. This process allows mutual profits to be maximised and, moreover, it better meets consumer needs. Category Management is not something to only consider every six months. It should never be the last minute afterthought ahead of an important meeting. It is a continuous process. Rushing it will only waste time and money. It will only lead to false insights into the category and its shoppers. Here at MBM, we have seen many companies experiment with Category Management. They might buy some data and produce some charts and tables for a presentation. However, it will often result in flaky interpretations. Insight shaped to a specific agenda. Typically, it is still the thinking ‘of old’. 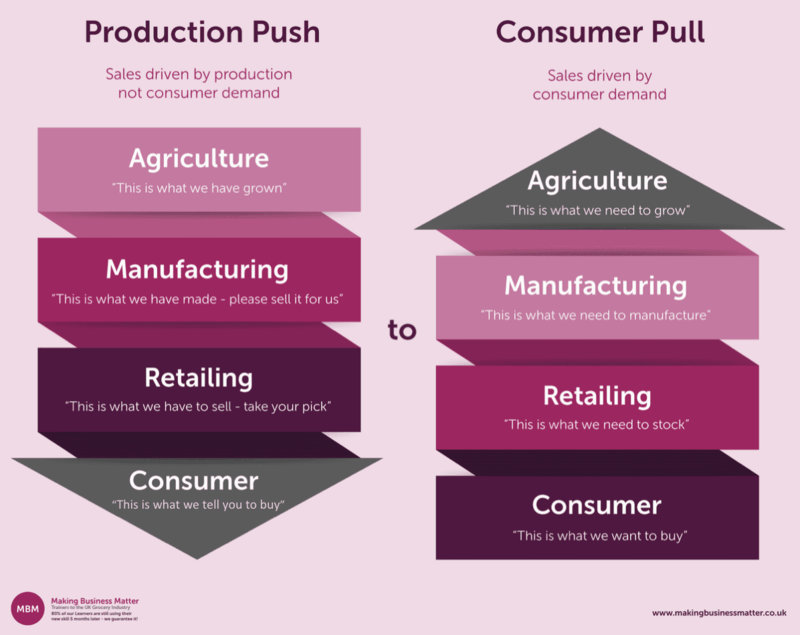 In short, Production Push mentality still hasn’t moved to Consumer Pull. Historically, the supply chain decided what they wanted to make or grow. Sales were driven by production. Or, as we like to call it, a ‘Production Push’. Consequently, consumer demand now drives sales. We like to call this ‘Consumer Pull’. Through data, consumers are telling us what they want to buy. It is the role of the supply chain to interpret and respond to this. Now we know what Category Management is, we need to appreciate the differences to its sister ‘Marketing’. It is often seen as an analytical difference. Category Management is about understanding data and facts to drive change. By contrast, shopper marketing is more about understanding emotions or motivations. True Category Management, whilst data led, is also about mindset. Category Managers need to live in shoppers, preparers and eaters shoes. This helps to identify and understand category opportunities. Remember, these insights help drive the whole category. In the age of big data, we are both fortunate and unfortunate in the amount of information we have available. At no other time have we had access to so much information. Retailers have got wise to this giving suppliers ‘the reins’ on data and research acquisition. Moreover, they are also involved in analysis and insight generation. This allows their expertise about a specific product category to be leveraged. Their knowledge and resources (people) are hugely valuable to the retailer. It must, however, be a two-way relationship. Regardless of the quality of their insights, suppliers and retailers need to work together. Imagine a pie. The pie is a category and is often supplied by many companies. Different sized slices make up all of the Category’s suppliers. Each of these will have different requirements. It is the role of the National Account Management (NAMs) to negotiate the size of their slice. This will fluctuate over time as they win and lose deals in tenders. Supply base rationalisations and changes in distribution shares will also play a role. The pie, however, stays roughly the same size in terms of sales value or volume. 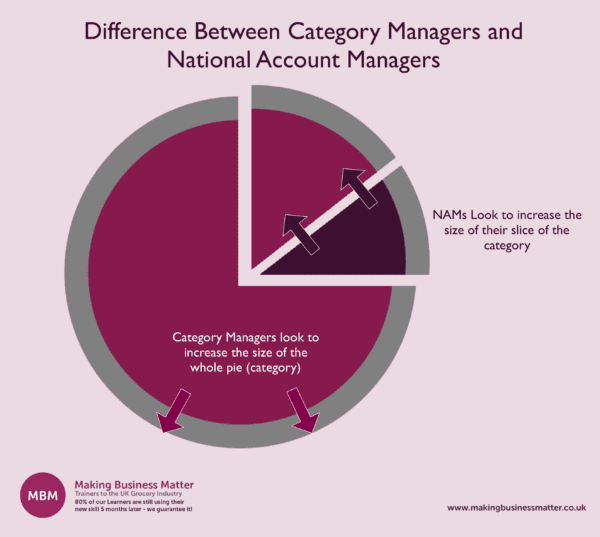 The Category Manager has a different agenda to the NAM, albeit still on the same payroll. This is because the Category Manager has the potential to grow the whole pie. They are experts in the requirements of their Category. Moreover, they know how to exploit opportunities to achieve supplier excellence. Their role is to look to grow the whole category. This should be beyond the 5-10% (+/-) fluctuation in the supplier’s slice size that you would expect to see over a 3 year period. It’s a brave company that invests in its people to grow their competitor’s sales …or is it? This is the key issue with good Category Management. It is why some companies see it as a reason not to adopt its core principals. Yet, it is important to look beyond this. It will not only deliver sales and profit increases for all involved. Good Category Management will often bring other immeasurable benefits. For instance, Category Captaincy and such associated titles. These are where a supplier is recognised and rewarded for their efforts. At a basic level, they can become the ‘first port of call’ for advice on category direction for the retailer. They could even become a ‘preferred supplier’ of new launches., becoming part of the inner circle of trust. This is where retailers may give a ‘heads up’ on pending opportunities and tenders. 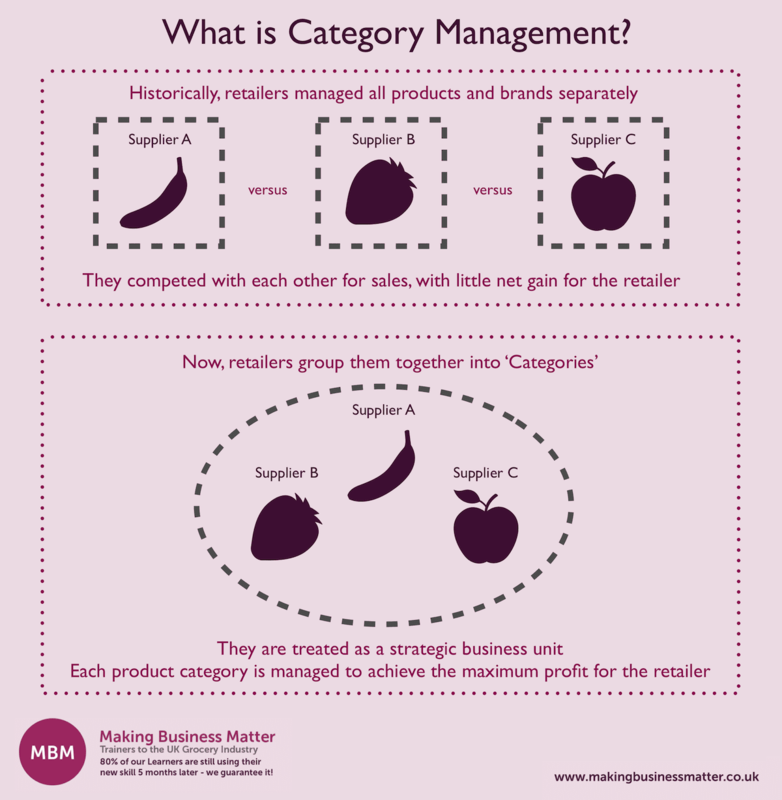 Are you new to Category Management? Do you want to further understand What Category Management is and what great looks like? Assess your category using our scorecard. 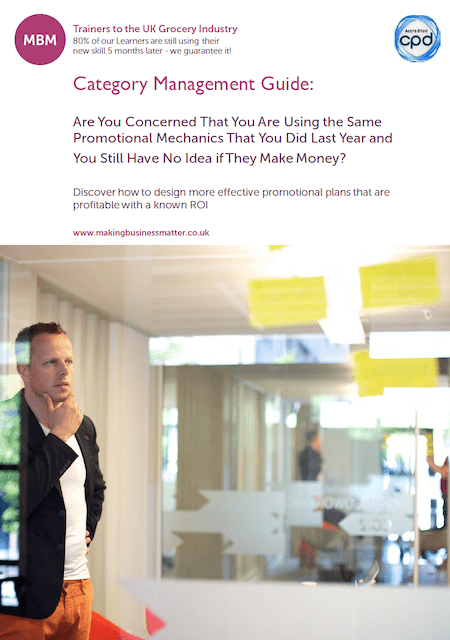 Would you like to generate sustainable growth for your category? How about investing in a 1/2 day Masterclass? Already in Category Management? Do you want to improve your Category Manager Training? How about learning some new Category Management Techniques? Take a look at our Category Management training and our e learning Category Management courses. Great post, the Category Management Model was very useful in explaining how change has occurred over time. Very easy to read and well explained. Really liked the comparison diagram, as well as the use of analogies. Also, helpful links at the bottom of the article, to further detailed posts. Helpful to see how the change has occurred over time, from production push to consumer pull. Well worth the read and as stated above, really good use of analogies.